Yangshan Port (Chinese: 洋山港, p Yángshān Gǎng, Wu Yan-se Kaon), formally the Yangshan Deep-Water Port (洋山深水港, p Yángshān Shēnshuǐ Gǎng, Wu Yan-se Sen-sy Kaon), is a deep water port for container ships in Hangzhou Bay south of Shanghai. 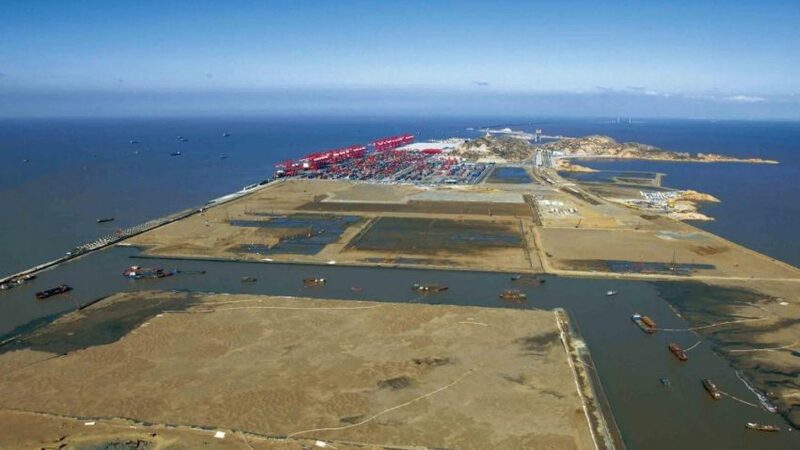 Connected to Shanghai’s Pudong New Area by the Donghai Bridge and forming part of the Port of Shanghai, the islands of Greater and Lesser Yangshan are administered separately as part of Zhejiang’s Shengsi County. It is connected to the mainland via the 32.5 km (20.2 mi) Donghai Bridge, opened on 1 December 2005 as the world’s longest sea bridge. The six-lane highway bridge took 6,000 workers two and half years to construct. In 2015, the port handled 36.54 million TEU up 3.5% over 2014. In 2013 the volume was 33.6 million TEU. In mid-2011, port officials said the port was on track to move 12.3 million TEUs during the year, up from 10.1 million TEUs in 2010.